The long products steel industry today continues to look to improved performance across a wide range of thermal systems. Fives is well positioned to address the needs with an emphasis on improving production and reducing emissions. 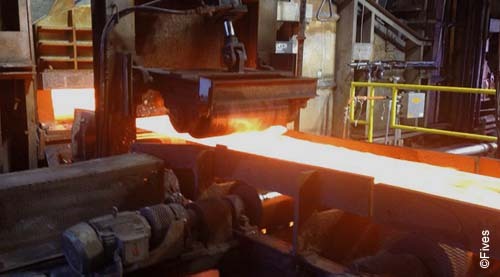 The steel industry today is focused on improving performance across a wide range of thermal systems spanning customized designs for upgrading steel process furnaces including reheat, slab preheating, soaking pit, heat treat, refractory preheat, and dryout of ladle, tundish, and torpedo car linings. Today’s drivers are directed toward improved production, optimum efficiency, low NOx and CO emissions, and rugged construction. Fives offers a wide range of superior combustion solutions to address these drivers. Fives, with North American solutions, develops various high technologies like the multi-fuel, regenerative systems, preheated air systems, variable heat pattern burners, Low NOx Fuel-Directed systems, permitting optimal production efficiency, low NOx emission and optimized fuel consumption. To ensure performance and availability all along the process, Fives offers hardwired BMS logic or Safety PLC BMS Logic. Fives offers a full range of auxiliary systems such as blowers, valves and regulators. Fives provides expertise and services spanning heating analysis, off-line heating models, energy audits, furnace optimization, heating strategies, and emissions analysis (furnace specific or plant wide) to ensure an optimal performance and improved availability of combustion equipment.